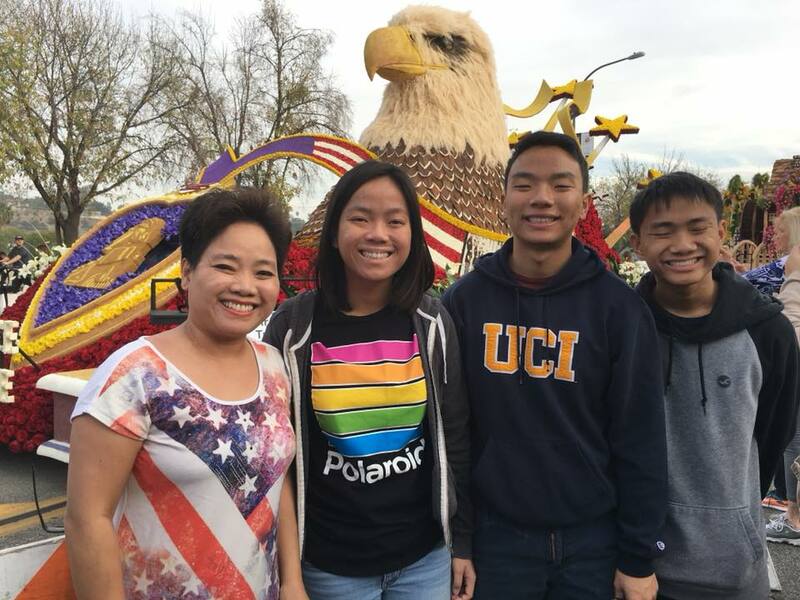 Family Photo at the Post-Rose Parade Float Viewing (from left to right: my mom, sister, brother and me). It feels like an eternity since I last touched my keyboard to write something that actually means something to me; type words for me and not for some painstaking SAT practice essay or melodramatic English narrative presentation. My first sports report on the Rio Hondo League Finals for track? An article on the anything-but-floral message of Troye Sivan’s “Bloom”? The possibilities for my next piece were endless. However, spending time in this desert of writing has made me realized that I haven’t thanked the one person who’s made all of this possible for me. Immigration has always been and will continue to be a topic of debate. There will always be someone who believes that opening the doors of America to foreigners is a formula for disaster, and there will always be someone who believes that America could benefit from a few extra hands. I know for a fact though that my mother falls into the latter category because she has sacrificed so much to provide the best education for me in this suburban utopia that is San Marino (the school motto is practically, “San Marino is the #1 unified school district in California”). She said goodbye to her father for the last time when she was 15, and the feeling was no stranger to her; her mom died from cancer several years before. She came to this unknown land and had the grit to become valedictorian of her high school despite a seemingly — insurmountable language barrier and with “nothing but the clothes on our backs and hope,” as my mom would always tritely say when she talks about her past. She gave up comfort, routine — everything that made her life recognizable; all in the name of a brighter future. One with happiness and the insurance that her children could grow up to be successful like their mother. And that’s just the abridged version. I’ve never felt more proud to be the son of a Vietnamese immigrant than when I look at my mom: so self-assured, so determined, so generous. It makes me wonder how much potential the United States is neglecting when we turn away citizenship applicants and war-torn refugees, and I often take it for granted that my parents were fortunate enough to pass through the system without the severe scrutinization so many immigrants fear today. Such luck deserves to be celebrated, especially in dire times like these where the flaws of society can be easily discussed in all mediums, including music videos (just watch Childish Gambino’s “This is America” or Janelle Monaé’s “Screwed” in “Dirty Computer”). So I smile from ear-to-ear in the car ride to Westminster, nicknamed “the Vietnamese capital of California” by yours truly, I slurp on phở religiously, and I sing along with some Vietnamese ballads (“Biển Nhớ” is an all-time fave). Of course, I wholeheartedly dread Lunar New Year’s cleaning, and the time I spend on schoolwork has deprived me of any opportunity to become fluent (my vocabulary in Vietnamese is basically limited to foods). But that gives me no reason to be any less proud of where my mother is from and who I am.